By the year 2030, more than 25 percent of the residents in Montgomery County, Maryland, will be over the age of 60. The projected increase is among the reasons the county joined the AARP Network of Age-Friendly Communities in December 2015. Although new to the network, the municipality has already advanced initiatives to serve its older adult population. 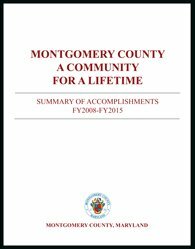 The county’s extensive work is outlined in the report "Montgomery County: A Community for a Lifetime: Summary of Accomplishments FY2008-FY2015." The plan identifies accomplishments during the past eight years in the community "domains" the World Health Organization (WHO) has found impact the quality of life for older adults. In November 2015, preliminary data from the county's ongoing age-friendly community survey showed that 2,041 responses had been collected from residents 55 and over on a range of topics including community characteristics and quality of life. The county will continue to plan, implement and evaluate best practices for making Montgomery County more age-friendly as part of membership in the AARP Network. According to preliminary results of the Age-Friendly Community Survey, 34 percent of respondents indicated that overall quality of life in Montgomery County is "Excellent," and 55 percent rated quality of life as "Good"
A chart from the Montgomery County Age-Friendly Community Survey. The community tripled the number of people using Connect-A-Ride, a service that helps age older and disabled residents learn about public, private and volunteer transportation programs. The number of people who used the service grew from 1,012 to 3,124 across FY2007-2015. Initiated as a pilot in FY2013, the Escorted Transportation program offers services to low- and moderate-income older adults and people with disabilities. Nearly 200 residents have enrolled in the program as of the end of FY2015, and 87 percent of the trips through the service were for medical or dental purposes. Due to new legislation, the county's taxi cab fleet will become 100 percent accessible by 2025. The county has increased senior center hours and accessibility and expanded recreation options for residents 55-plus. For example, a "Bone Builders" exercise program offered 18 classes in 2015, up from 10 classes in 2012. The county served twice as many homebound senior residents meals at home compared to FY2013. The increase is due in part to an expansion of the number of buildings served to include 900 seniors in 18 low-income housing sites. Increasing and protecting the availability of affordable housing are key priorities for the community, and 983 new units are either in planning or under construction. An annual "50+ Employment Expo" that offers residents job hunting guidance is an ongoing event that boosts civic and social engagement. Montgomery County promotes fire safety for senior citizens by making home visits to check smoke alarms and confirm home fire escape plans. In the first 10 months of the program, more than 1,000 residences have been visited. The report includes a wealth of information for community leaders, businesses and citizens looking for ideas about age-friendly community efforts. For each age-friendly domain, the report summarizes work done to-date and, in some cases, indicates future goals.